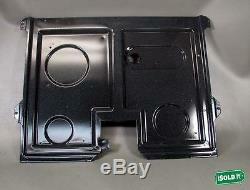 NEW GENUINE JENN-AIR MAGIC CHEF MAYTAG FACTORY RANGE BOTTOM BURN BOX # 74001695. NEW GENUINE JENN-AIR MAGIC CHEF MAYTAG. FACTORY RANGE BOTTOM BURN BOX. BRAND NEW IN FACTORY BOX. GENUINE MAYTAG PARTS FIT THE FOLLOWING BRANDS. Whirlpool, Maytag, KitchenAid, Jenn-Air, Amana, Magic Chef, Admiral, Norge, Roper, and others. FITS THE FOLLOWING MODEL(S). Magic Chef 3527XUA Range - F/s Std Ele Magic Chef 3527XUW Range - F/s Std Ele Magic Chef 3867VVD Range - S/c F/s Ele Magic Chef 3867VVV Range - S/c F/s Ele Magic Chef 3867XVB Range - S/c F/s Ele Magic Chef 3868KYW-D Range - S/c F/s Ele Magic Chef 3868SYA Range - S/c F/s Ele Magic Chef 3868SYW Range - S/c F/s Ele Magic Chef 3868VVD Range - S/c F/s Ele Magic Chef 3868VVV Range - S/c F/s Ele Magic Chef 3868XVA Range - S/c F/s Ele Magic Chef 3868XVB Range - S/c F/s Ele Magic Chef 3868XVW Range - S/c F/s Ele Magic Chef 3888XVB Range - S/c F/s Ele Magic Chef C3868VYV Range - S/c F/s Ele Magic Chef C3888VVV Range - S/c F/s Ele Magic Chef C3888XVA Range - S/c F/s Ele Magic Chef C3888XVW Range - S/c F/s Ele Crosley CC3878VYV Range - S/c F/s Ele Crosley CE3537XUA Range - F/s Std Ele Crosley CE3537XUW Range - F/s Std Ele Maytag CRE7900ADE Range - F/s Std Ele Maytag CRE7900ADM Range - F/s Std Ele Maytag CRE9590CCL Range - S/c F/s Ele Maytag CRE9590CCW Range - S/c F/s Ele Maytag CRE9600CCE Range - S/c F/s Ele Maytag CRE9600CCM Range - S/c F/s Ele International CRE9600CGE Range - S/c F/s Ele Maytag CRE9600DDE Range - S/c F/s Ele Maytag CRE9600DDM Range - S/c F/s Ele Maytag CRE9800CCB Range - S/c F/s Ele Maytag CRE9800CCE Range - S/c F/s Ele Maytag CRE9800CCM Range - S/c F/s Ele Maytag CRE9800DDB Range - S/c F/s Ele Maytag CRE9800DDE Range - S/c F/s Ele Maytag CRE9800DDM Range - S/c F/s Ele Maytag CRE9830BCB Range - S/c F/s Ele Maytag CRE9830BCE Range - S/c F/s Ele Maytag CRE9830BCM Range - S/c F/s Ele Maytag CRE9830CDB Range - S/c F/s Ele Maytag CRE9830CDE Range - S/c F/s Ele Maytag CRE9830CDM Range - S/c F/s Ele Admiral CREA650ACB Range - S/c F/s Ele Admiral CREA650ACL Range - S/c F/s Ele Admiral CREA650ACW Range - S/c F/s Ele Jenn-Air FCE30510A Range - S/c F/s Ele Jenn-Air FCE30510B Range - S/c F/s Ele Jenn-Air FCE30510W Range - S/c F/s Ele Jenn-Air FCE30600A Range - S/c F/s Ele Jenn-Air FCE30600B Range - S/c F/s Ele Jenn-Air FCE30600W Range - S/c F/s Ele Jenn-Air FCE30610A Range - S/c F/s Ele Jenn-Air FCE30610B Range - S/c F/s Ele Jenn-Air FCE30610W Range - S/c F/s Ele Jenn-Air FCE30610WC Range - S/c F/s Ele Jenn-Air FCE30611WC Range - S/c F/s Ele Jenn-Air FCE70610A Range - S/c F/s Ele Jenn-Air FCE70610B Range - S/c F/s Ele Jenn-Air FCE70610W Range - S/c F/s Ele Norge L3878VVV Range - S/c F/s Ele Norge L3878VYV Range - S/c F/s Ele Norge L3878XVA Range - S/c F/s Ele Norge N3878VVD Range - S/c F/s Ele Norge N3878VVV Range - S/c F/s Ele Norge N3878XVA Range - S/c F/s Ele Norge N3878XVW Range - S/c F/s Ele. Additional quantities of many of these items are often available, please contact iSOLD It for more information. This inventory is brand new in box and has never been used. Our store professionals use first-quality materials to pack items with care. Larger & heavier items requiring additional packaging or oversized boxes may take additional time. There will be no exceptions. You may also call our store or stop by during regular store hours. ISold It ks0208: 6700 S Topeka Blvd, Bldg 820 PO Box 19004 Topeka, KS 66619 Telephone: 785 232 3229. How does iSold It help sellers? Can you send me additional photos of the item? What does "Powered on but not tested" mean? Professionally photograph each item selected for sale 3. Design a listing with descriptive and enticing copy points 4. Select a merchandising and sale strategy for your item(s) 5. Handle any and all follow-up sale inquiries or issues. Due to the high volume of items we receive each day, we cannot take additional photos of specific items. This means that we have plugged in and turned on the item to see if it started up, but have not performed additional testing. We make every effort to fully test items we sell. ISold It runs thousands of auctions every day. The ISI# is a unique number we assign to our auctions to track them in our internal systems. Please refer to the ISI# whenever possible when contacting us for customer assistance. ISold It is the #1 chain of drop-off stores in the U. From start to finish, we do it all. Friendly and fast market research on your item(s). Design a listing with descriptive and enticing copy points. Determine the optimal merchandising and pricing strategy. Handle follow-up sale inquiries or issues. The item "NEW GENUINE JENN-AIR MAGIC CHEF MAYTAG FACTORY RANGE BOTTOM BURN BOX # 74001695" is in sale since Saturday, May 16, 2015. This item is in the category "Home & Garden\Major Appliances\Ranges & Cooking Appliances\Parts & Accessories".ks0208" and is located in Topeka, Kansas. This item can be shipped to North, South, or Latin America, to all countries in Europe, to all countries in continental Asia, to Australia, ZA, to New Zealand.